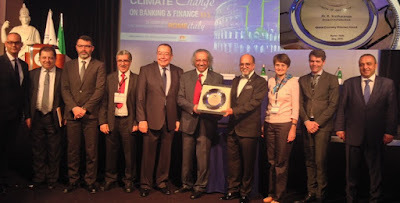 Home > News - May 2016 > DOHA BANK CEO HONOURED WITH “GREEN ECONOMY VISIONARY AWARD” At Union of Arab Bank SUMMIT 2016. DOHA BANK CEO HONOURED WITH “GREEN ECONOMY VISIONARY AWARD” At Union of Arab Bank SUMMIT 2016. The 2016 Union of Arab Banks (UAB) International Banking Summit was held under the Auspices of the Prime Minister of Italy H.E Mr. Matteo Renzi on May 29- 30, 2016 at Rome Cavalieri Waldorf Astoria Hotel Rome – Italy. Dr. R. Seetharaman, CEO of Doha Bank was honoured with the “Green Economy Visionary Award” at the Summit on 30th May 2016. He received the award from Mr. Mohammed Jarrah Al-Sabah, Chairman, Union of Arab Banks in the presence of Mr. Wissam H. Fattouh, Secretary General Union of Arab Banks, H.E. Mr. Mohammad Machnouk, Minister of Environment, Lebanon, Mr. Sarkis Yoghourtdjian, Advisor, Federal Reserve Board, Washington DC, Mr. Mustapha Bakkoury, President du Directoire, MASEN, Morocco Mrs. Michele Caparello, Advisor to the Executive Board, European Central Bank, Mrs. Michele Caparello, Advisor to the Executive Board, European Central Bank and Mr. Eric Usher, acting Head of the United Nations Environment Programme Finance Initiative (UNEP-FI), Switzerland. The award was given to him by for his outstanding contribution close to two decades towards environment friendly activities and thereby promoted Green economies. He is a recipient of multiple doctorates including the Ph.D. Degree on “Green Banking and Sustainability” from Sri Sri University, India in 2015. Recently he was also recommended for “Nobel Peace Prize“by H.E Nassir Abdul-Aziz Al- Naseer, United Nations High Representative for the Alliance of Civilizations.